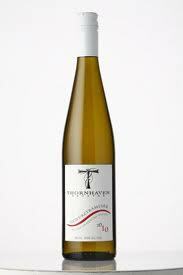 This wine has won numerous plaudits including the BC Lieutenant Governor’s Award. It hardly needs a thrift-minded anti-wine-snob to weigh in with adjectives. It is good, very good for what it is, and deserves every ounce of praise. It was spectacular with a pan fried fresh trout but equally good as an aperitif with some local cheese and dried fruit (although not heady enough to do justice with homemade gazpacho). If you surfed here from page 10 of a Google search looking for flavour notes you are either bored or made a mistake. Quick: Click back and search for a retailer. So, superfluous adjectives aside, I will however editorialize: Light, elegant, nuanced whites should be the backbone of the Okanagan. The simple fact that Thornhaven can produce this much quality, and bring it in under $20, should set the stage for more and better vintages from Naramata to Cawston. Cripes, BC could give Germany, Switzerland and Alsace a run for their money with nectar like this; but you know that’s a pipe dream. We will continue the endless pursuit of better reds, priced at twice what you can already get from other New World vineyards, in a largely mistaken quest to be something we can never be: Internationally price competitive with robust reds. Praise to those who break the trend. Price: A superb value at $19.90 at your friendly VQA stores. Market Liquidity: What price glory? Under $20 at Thornheaven, er Thornhaven.